Staples' Kenny Brill, right, goes for a shot during Class L quarterfinal action against Conard on Friday. 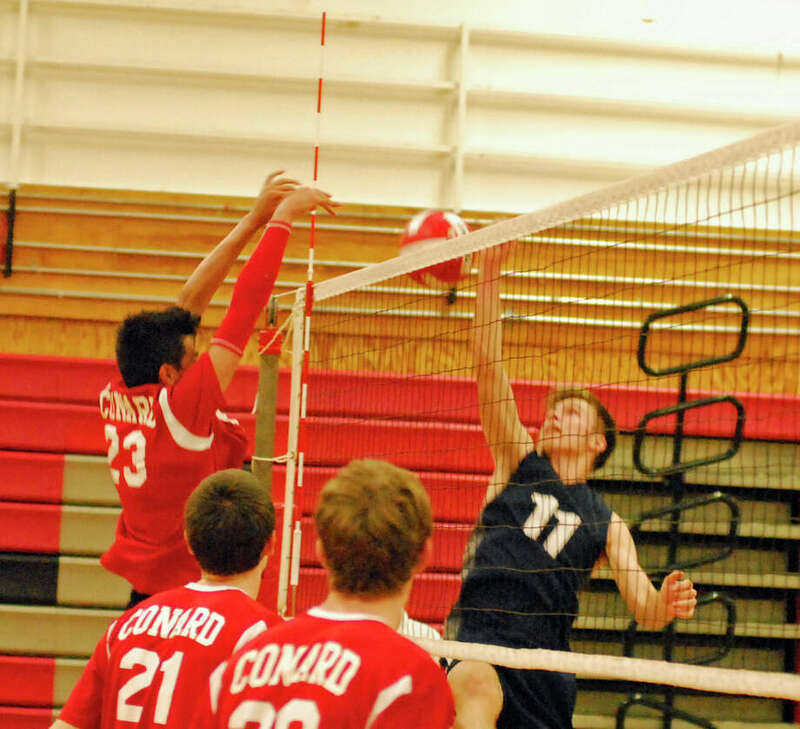 WEST HARTFORD — There was little separating the Staples and Conard boys volleyball teams through the first half of their Class L quarterfinal on Friday evening. The teams split the first two sets and the Staples lead in the third was just 15-13. However, the Wreckers began firing on all cylinders from there, quickly pulling away from the Chieftains to claim a 3-1 (25-17, 19-25, 25-14, 25-19) win on the road to advance to the Class L semifinals. The No. 6 Wreckers face off with No. 2 Darien on Tuesday at at 6 p.m. before Warde. Staples found a new level behind a combination of stellar offense and defense. A trio of Wreckers — Andrew van Riper (17), Jared Himmel (12) and Kenny Brill (10) had at least 10 digs. One save by Himmel during the pivotal third set appeared to swing the momentum toward the visitors for good. The narrow third set lead grew as the mistakes disappeared and the hits began to land. Daniel Brill led a strong serving run as the Wreckers closed with 10 of the last 11 points. Staples rode that momentum to an 8-3 lead in the fourth game before Conard closed to within 9-7. The lead steadily grew and wasn’t lower than four points for the rest of the set. The Chieftains (15-3) ran through most of its Central Connecticut Conference schedule in a breeze, including sweeping their last seven opponents. Conard hadn’t played a competitive game in nine days before matching up with the battle-tested Wreckers. Conard showed what it could do in the second set by jumping out to an early lead. The Chieftains capitalized on several serving errors and made a number of crucial saves of their own. The strength of the top of the FCIAC has strengthened the Wreckers’ game but they will have to get by the conference champion Blue Wave in order to win their first state title since 2013. Staples fell 3-1 to Ridgefield in the FCIAC semifinals and lost twice to Darien in five sets during the regular season. Records: Staples 15-4; Conard 15-3. Highlights: S—Stedman van Ardsdale had nine kills. Andrew van Riper had 17 digs. Jared Himmel had 19 kills and 12 digs. Kenny Brill had 46 assists and 10 digs.